Here at SuperSkills, we care about our customers. I’ve thought long and hard about writing this, because the last thing I want to do is unnecessarily scare people – or worse still, for suggestions to be made that we’re indulging in some sort of “Project Fear”. However, it’s sometimes right to tell people something they might not want to hear. 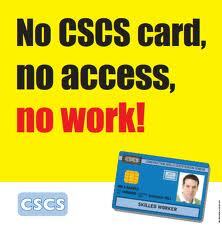 I always worry about the phone calls we get from people who have allowed their CSCS Card to expire before they make arrangements to be assessed – or who have never obtained one. It is particularly concerning when they have already been sent away from a site, because they are going to have to find work elsewhere, on a site that has not become as strict as most when it comes to cards, or even go back to the domestic market. Historically, we got those calls about once or twice a week. However, I get the impression things are getting more difficult for people who have yet to get their NVQ’s sorted out. This morning, I have received two calls – one of them first thing today – from trades who have been turned away. The second was from a gang of people due to start on a new site. We will move heaven and earth to get your assessment sorted as soon as we can – but we have no control over the time it takes for your qualification to be issued by CSkills Awards. We always tell people to allow up to a month for that certificate to arrive (it’s sometimes quicker, but we can’t guarantee that) so if the site you need to work on says “No Card, No Job”, that’s a problem. We’re good here at SuperSkills – even if we do say it ourselves – when we say quick, simple and convenient, we mean it. We do find some sites will allow people on if they have arranged their assessment and others if the individual has a temporary CSCS Card issued when they have started their assessment programme. But I’m not sure I would bet my mortgage payments on it. That’s why we were the first training provider in the country to set up an “Easy Payment Scheme” – open to all our clients. We recognise that getting the NVQ assessment is an unexpected – and unwanted – expense, so we try to take as much pain as possible out of the process. So – if you need to get your NVQ, just call us on 01845 527445 and we will get you in for assessment as soon as we can – then you can relax in the knowledge you won’t be one of those facing the prospect of getting sent home early.